Buying a used luxury car is truly the easiest way to get the best of both worlds. You get fantastic performance and luxury features that make day-to-day driving a blast, while at the same time being able to pay a much more reasonable price than with a new car. However, this only works if you make sure yo find the exact vehicle that works best for you. Luckily, Certified Autoplex is here to help you with that part of the process by highlighting some of the great vehicles we have available for sale. Here, we will be giving details on the Mercedes-Benz C300 sedan. With the word sedan often comes certain connotations for some drivers: people assume it is a boring vehicle that is all about practicality and nothing else. However, when you get a sedan from Mercedes-Benz, this could not be further from the truth. Let's take a closer look at some of the great features that make up the Mercedes-Benz C300. 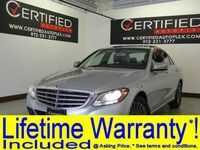 If you are in the Dallas TX area and are interested in a used Mercedes-Benz C300, you can follow this link to our inventory of the vehicle. 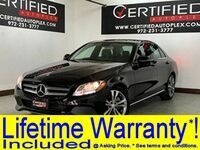 We currently have over eight models of the Mercedes-Benz C300 sedan available at Certified Autoplex. These sedans have countless great features to offer drivers when it comes to performance, safety. Security, luxury and more. Let's take a closer look at some of these features. In terms of performance, this vehicle has some great features for power and handling. The turbocharged engine in the C300 generates up to 241 horsepower and 273 lb-ft of torque, which gives it a ton of get-up-and-go. Combine this with the 7-speed automatic transmission, available four-wheel drive, independent multi-link suspension, electronic stability system and more all put the driver in full control of the vehicle at all times. In terms of safety and security, this vehicle has a lot to offer to keep you safe inside your vehicle, and make sure your vehicle never ends up in the wrong hands. Safety features include things like traction control, lane-departure warning, blind-spot monitoring, knee protection airbags and more. Security features include stolen vehicle tracking, keyless access system, ignition disable, remote keyless entry and much more. Finally, it is fairly obvious that the Mercedes-Benz C300 has a ton of great luxury features to choose from for convenience, comfort and entertainment. Some of these great luxury features include a voice-activated navigation system, 8-speaker audio system w/amplifier, temperature-controlled seats, USB ports, dual-zone automatic temperature control and much more. Interested in a Mercedes-Benz C300?